The pharma industry has been in a state of constant flux for a very long time. I can recall intense discussions at the turn of the Millennium, when we debated how the industry could survive the demise of the blockbuster drug model amidst the rise of generics... yes it still prevails. The quirkiest issue I have observed with pharma, over the years, is that their leading firms like to outsource all the high-value work, such as contract manufacturing, drug discovery and R&D, while keeping the back office stuff inhouse, namely IT, HR and F&A. Pharma has been the weird stepchild of outsourcing - moving out the core, while retaining the non-core. Fortunately, we have Barbra McGann, our Executive Vice President, Business Operations Research, to lead the charge in researching our first-ever Blueprint Report on Pharmaceuticals Industry-Specific BPO to delve into how our leading pharma are behaving, and how the service providers are performing to attend to their needs. Why produce this Blueprint report now, Barbra? There is some pretty spectacular and mind-boggling activity today in the pharmaceuticals industry, with the 3-D printing of pills, use of IBM Watson to cull through reams of data and help diagnose and personalize therapies, and edible devices that can transmit data and images. Behind the scenes, too, there are some significant changes underway that are also critical to helping this industry—enabling it to operate in a way that re-focuses on the patient, and helps pharmaceutical, biotechnology and medical technology companies shorten trial times and accelerate time to market, increase medical adherence, reduce risk, and manage compliance. This operations support, having taken shape over the past two decades as the Pharma BPO industry, is on its way now to the As-a-Service Economy—with service providers bringing together industry and operations experts, digital technology and new operating models to collaborate with willing service buyers. Two of the significant ways that pharmaceuticals companies “touch” consumers are in the R&D process and through sales and marketing (aka commercial services). The pharma BPO market in this Blueprint covers clinical data management services, safety management services, regulatory affairs support, and related sales and marketing—all activities that we recognize are part of a highly regulated, complex market in the midst of global expansion and change. The objective of the Blueprint report is to evaluate the nature of engagement and support between the service buyer and the service buyer across these tasks. How did this Blueprint take shape? In this Pharmaceuticals Industry-Specific BPO HfS Blueprint, we take a look at the evolution of Pharma BPO to “As-a-Service”: a services market that is increasingly agile, collaborative and consumer-centric. HfS considers this transition in outsourcing a move to the As-a-Service Economy, placing increasing value on diverse talent, analytics, and collaboration, as well as increasingly on platform-based services. 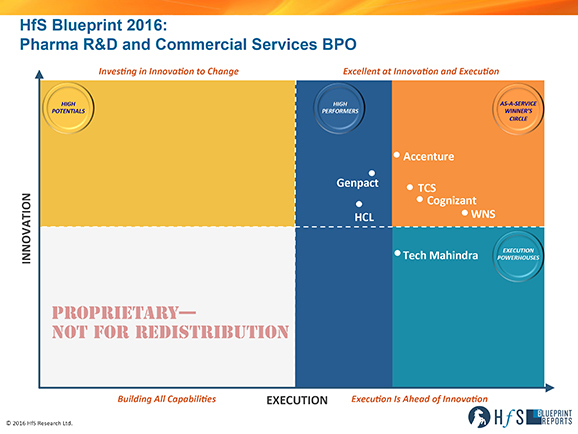 To develop this Blueprint, we spoke to service buyers and service providers to understand the innovation and execution capabilities of seven multi-national, multi-functional service providers with industry-specific pharmaceuticals business process support capability in their portfolio: Accenture, Cognizant, Genpact, HCL, TCS, Tech Mahindra, and WNS. And how did the service providers perform, based on your research with the buyers? We want to understand a variety of different things in order to compile this Blueprint. How do service buyers approach business process outsourcing—what is working well and what could use a “rethink” or refresh? How are service providers extending their capabilities for data management, analytics, and talent development and management? And how are digital technologies such as automation, social, mobile, and cloud being approached and used; what value are they providing for BPO? In short, how is this market changing to become more “As-a-Service”—business-outcome oriented and flexible through the combination of capable people and digital technology. Accenture stands out for its grasp of technology from a business mindset—how to architect a best of breed technology solution with platform and services. In this case, it’s for data aggregation and analytics by the Accenture Life Sciences Cloud Coalition with 8 biopharmaceutical companies and Oracle among its network. The vision is in place, and it needs to really execute holistically. Cognizant is making progress with both its “run better” and “run different” approaches to services. In this case incorporating automation into targeted accounts to progress the former; and receiving accolades for its SmartTrials tool for centralized monitoring, reporting, and analytics. Cognizant is building out an impressive suite of solutions for supporting drug development and marketing, and has the clinical and non-clinical resources globally to support it. With its Digital Clinical Trials, TCS is also bringing a platform for clinical data management, patient engagement, and analytics; and has defined a program for developing Data Scientists. The approach seems mostly technology-led, and needs to pivot to a focus on business outcomes and impact, with expertise and technology mapped into the business case. Genpact started in pharmaceuticals BPO with finance and accounting work where it has a strong presence; and then started expanding with PharmaLink for regulatory affairs support, and EmPower for social media research, adding to its marketing capabilities. It is on a path to help clients better leverage their existing capabilities and systems, and bring in Genpact to complement, using its very sound LeanDigital and Systems of Engagement approach. Broadening from its IT start in pharmaceuticals, HCL is developing a robust set of tools using automation, analytics, and cloud-based services but lacks a cohesive story and momentum with BPO. There is quite a bit to work with, however, so HCL shows promise in partnering with clients to deliver in clinical support and patient services in particular. Tech Mahindra has added - and grown - point solutions to support artwork and labor management, creative services support, supply chain analytics, and transportation management in particular. While it is small by comparison to the other players and still is primarily a labor-based offering, it has carved a niche in these areas. What do we see changing in the future, Barbra? In general, HfS believes that service providers need to make their services more accessible. There are a lot of technology solutions being developed, a lot of skilled resources with advanced degrees and training, and a lot of change underway. The entrée point for a service buyer is getting more complex, not less so, in an industry that needs simplification. Service buyers need to be open to sharing problems and asking questions of service providers, challenging them to look outside their industry and their ready-made pharma toolbox for ideas and examples that while they may not be usable in pharma directly due to regulations, can still inspire and lead to relevant solutions. That means buyers –and we heard a mix of this during our interviews—need to consider service providers “part of the team,” and even an extension within their leadership. Accenture and WNS have made considerable progress along these lines with some of their clients in pharma R&D and research and marketing respectively. Due to the significance of change required in an operating model, and with the added complexity of regulation and the possibilities of digital technology, Pharmaceutical companies can take advantage of the existing and developing depth in their service provider partners. One area where multifunctional service providers can add value is in bringing together consulting, subject matter expertise, practices from other industries for ideas and inspiration, and internal and external partnerships with software and digital technology companies. And what do you see, Barbra, along the road, for Pharma BPO? Clinical trial data management: Many of the service providers in this study have or are developing platforms with complementary business services expertise to manage clinical trials and data from multiple sources, and create real-time dashboards for analysis that can also be supported. Accenture, Cognizant, HCL, TCS, and WNS. There is no shortage of options, so the key is to work with a trusted partner that can also collaborate with the service buyer’s ecosystem. Patient Support: As ensuring that clinical trials are successful increasingly means better understanding patients and engaging both them and their physicians, service providers are also developing expertise and solutions that help identify patients for studies, reach out and engage them, and also help provide support during clinical trials for “life” challenges such as getting to appointments. Accenture is working on an Intelligent Patient Platform, and Cognizant has HealthActivate. Remote Site Monitoring: A high-cost area ripe for applying new operating models and use of digital technologies that almost every service provider in our study is addressing in some way. Cognizant and TCS have the most advanced models, but HCL and Genpact also have capability to help address this area, to help minimize and strategically target on-site visits, reduce risk, and overall, enhance patient safety. • Sales and Marketing Content and Campaigns: Cognizant has the most comprehensive business process as a service offering for supporting sales and marketing operations in pharma; but Accenture (particularly for asset management and campaigns) and Genpact (with analytics expertise) are also providing services in this area. The WNS research and analytics services dive into clinical, sales, and marketing for enabling targeted campaigns. As more than one service provider pointed out, these efforts are to help change an industry that has a lot of players to bring together. Regulators are in the same learning process as pharmaceutical, medical device, and health care organizations in terms of understanding what digital technology and new operating models can do, how it can impact drug development and health care, and how therefore does regulation need to change accordingly. From a broader industry perspective—considering the client base of today and tomorrow for these services—HfS sees the opportunity and heard from the service providers expansion from the “traditional” client portfolio of the “top” pharmaceutical companies to also provide established services to smaller start-ups, medical device, and biotechnology companies. We see the industry changing to not just be about providing services to the largest pharmaceutical companies, but also to a growing number of these other industry participants around the world. Barbra McGann can be tweeted at @SheridanMcGann. HfS readers can click here to view highlights of all our 31 HfS Blueprint reports. See our plans for 2016 Blueprints here.